Tooth bridges are recommended in cases you lost one ore more teeth. Whole which remains in case of loosing teeth, can cause remaining teeth to rotate or get crocked in to empty space, which further results in bad chewing of food. Imbalance which is result of lost teeth can cause ilness of gum and defect of temporomandibular joint(TMZ). With bridges we fill the space where teeth are missing. For the base of this repairment we use teeth next to the one that is missing, or dental implants. 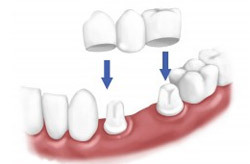 When using teeth next to the missing tooth, they are sanded and onto them are put dental crowns which are joined together, and together they make a dental bridge, which then fills up empty space. As well as for the crowns, you can choose material from which are made the bridge you are going to have. This also depends on a position of the tooth, and function it have in chewing, but it can also depend on your financial situation, in which case we can recommend which dental bridge is the best one for you. metal-ceramic , with a metal base, which is made of stainless medicinal steel, Chromium-molybdenum alloy, and ceramic outing. Base can be much more costly, like those which are made from titanium. Ceramic bridge, which is made soley from ceramic and zirconium. They are more recommended for front teeth, which caries less force. Process is the same as with making crowns, only between already made crowns, dental bridge is formed, and in that place are added teeth which are missing. Also, tooth which is already in its place can be sanded, or it can be attached on implants. Dental bridges are fixed, and can not be taken off. Bridges can last for a lifetime, but they can also get loose, and fall off. Bridges can fall off only in case when the teeth on which are bridge is attached, get ill. The most important step in keeping your bridge in place is good oral hygiene. That means that you need to brush your teeth regularly with toothpaste. Second important thing is to visit us regularly, so we can see in time are there any kind, or signs of illness. Also, one of important things is that you can rely on your dental crown, so you can almost forget that your teeth are mush more vulnerable, which can lead to chipping your healthy teeth, so try to avoid hard to chew hoods.